Now that you've built a pergola over your patio or an arbor in your garden, it's time to select the perfect vines to climb and decorate your overhead structure. In addition to providing shade, vines emphasize the shape of a pergola or arbor, whether it's arched, flat, or some other configuration. Living, growing greenery can also soften a structure. Consider these vines that are easy to grow, like full sun, and are drought tolerant once they are established. An added bonus: some produce pretty, colorful flowers and a nice fragrance. Vines are presented in alphabetical order. Flower Color: It's not flowers that bloom, but large, papery, colorful bracts that come in various shades of red, pink, purple, orange, white, yellow and orange. If you want a vine that produces a riot of color up and across an arbor, trellis or pergola and you reside in a Mediterranean or sunny climate, bougainvillea might be your answer. This native to tropical and subtropical South America can be planted in a container and used on patios as a summer annual, then moved to a protected area during the winter. This vine can grow quickly, depending on the variety. If training on an outdoor structure, tie shoots to a strong support to avoid wind damage. Flower Color: White or pink. A native of Australia, P. jasminoides grows quickly and produces white flowers with pink throats that bloom from late spring to early fall. One variety, 'Deep Pink Form', is fragrant. It prefers regular water. Size: Up to 40 feet or more. This South African native can be hard-pruned into a shrub, or, left alone, quickly becomes a vine with shiny dark green leaflets. Hardy, Cape Honeysuckle withstands wind, salt air, and requires little water once established. Flowers are compact and appear from fall into spring (in warmer climates). This Southern-sounding beauty is actually a native to the southeastern U.S. Leaves are shiny and light green, attached to long branches that grow in different directions. Climbing up a trellis, arbor or pergola, Carolina Jessamine's vines will hang down and blow in the wind. Yellow flowers are trumpet shaped and fragrant. A native to Japan, China and Korea, Akebia is admired for its dainty leaves and dangling clusters of vanilla-scented flowers. Chocolate vine bears edible fruit that looks like long, purplish sausage. 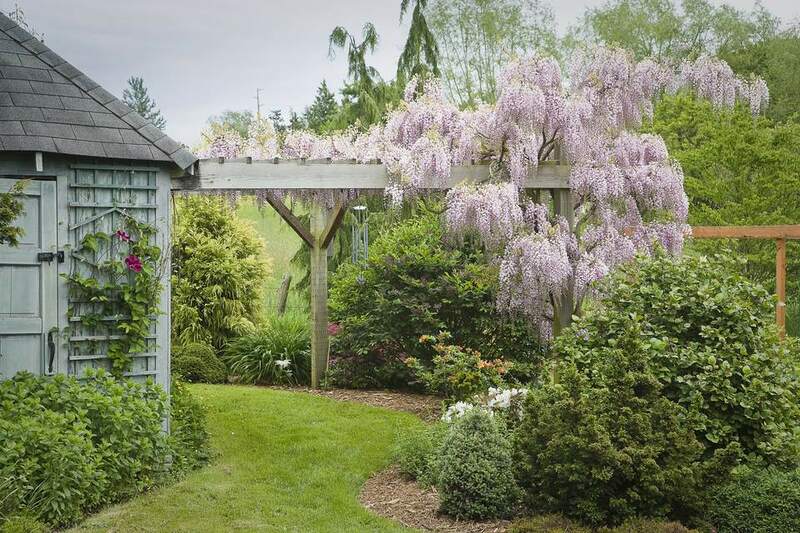 Arbors, trellises and pergolas help support this climber. Flower Color: More than 200 species exist, and colors include blue (pictured), red, pink, white, lavender, magenta, dark purple, yellow, and more. Size: Some varieties can reach 20 feet and beyond. This beautiful vining plant requires about 6 hours of daily sunlight to get the greatest number of blooms. Plant where Clematis can climb up an arbor, pergola, trellis or fence to give the stems support. A long-held belief is that clematis must be planted with its "feet in the shade and head in the sun"; but regular water and mulch should be sufficient. Plant near shallow ground covers or plants that won't compete for root and ground space. Colors: A variety of colors, like white, pink, red, yellow, etc. The climbing species can be vigorous, covering the roof of a house or up into a tree. The more moderate climbers are ideal for pergolas and arbors. Besides being beautiful, some have intoxicating scents. Flowers or Fruits: Grapes are purple, green, black, or combinations of these colors. Size: Can grow to 20 feet or more. Take a drive through California's highways and backroads, and you'll see grapevines growing on hills, in front yards, and seemingly every spare plot of land. Everyone is taking advantage of the climate and soil to grow grapes and make wine. Grape-growing for wine making is not just a matter of growing a few vines and making wine in the basement. While grapes definitely prefer a Mediterranean climate, they aren't limited to those regions. One thing grape vines need is support, and a pergola or arbor provides the perfect framework for them to climb and thrive. A fast-growing native to China, Giant Burmese honeysuckle is an especially attractive vine for arbors and pergolas, although it needs strong support. Leaves are oval, glossy and dark green, while flowers blossom white, turning to yellow and orange. Flowers pop up in summer and are fragrant. Flowers: White, which open at night or on overcast days. Needs heat to bloom. Moonflower is a fast-growing vine that provides quick shade for an arbor or pergola. Funnel-shaped flowers are fragrant. Flower Colors: White, pink, purple, red, yellow, orange, with different colored centers and all kinds of variations. Some species are fragrant. Size: Can climb to 40 feet or more. Natives of tropical Americas, Asia, Amerasia, Australia and the South Pacific, the genus includes more than 500 species, most of which are vines. When provided support, like a pergola or arbor, a passion vine will attach to the structure and other plants with coiled tendrils. Passion flowers are tolerant of most soils, but like regular water and sun with dappled shade for optimum growing performance. Blue passion flower (Passiflora caerulea), pictured, bears edible fruits (maypops). Wait until the fruit is fully ripe before eating, as unripened passion fruit can cause stomach pain. Some species have long been used as healing herbs to help insomnia and anxiety. Flower Color: White and rose. Size: To about 20 feet. This evergreen vine hails from China and is popular for its highly fragrant blossoms that are rose on the outside and white inside. Jasmine can be planted in the ground or in containers and trained over arbors or pergolas. In warmer climates, it blooms during the late winter through spring, but flowers can appear throughout the year. Flower Color: Red, orange and yellow. Also known as common trumpet creeper, this vine is a native to the eastern United States and is popular in cold climates, but will grow in other regions as well and is drought tolerant once established. A fast grower, it can quickly reach 40 feet. Tubular flowers bloom throughout the summer months. The showy, trumpet-shaped flowers of this vine are deep red to orange, but have no scent. It blooms from late spring through summer, and also produces long leaves that are medium green above and bluish green beneath. Some varieties, like 'Cedar Lane', are vigorous growers. Wisteria that is grown as a vine should be pruned and trained to control size and shape and to produce a strong trunk. Cut back or pinch long streamers and side stems and tie the stem to a stake or arbor. What is a Garden Arbor Used For? Every Garden Needs a Turtlehead, for Late Season Color.